Teacher Resources > Monday Morning Ready > Why do we play "Hail to the Chief" for the president? Why do you think the Department of Defense keeps such close tabs on how and when "Hail to the Chief" is played for the president? In the U.S., playing the song "Hail to the Chief" is one of many traditions related to the president. What other traditions can you name? Based on what you know about U.S. history, why do you think American audiences loved the "glamorous bandit" in "The Lady of the Lake" instead of the poem's hero? According to the article, the song "Hail to the Chief" was a popular parlor song in the early 1800s. It is now used to honor the president. Imagine that Americans decided to replace that song with a more modern tune. Which popular song do you think would be the most appropriate to use? Why? 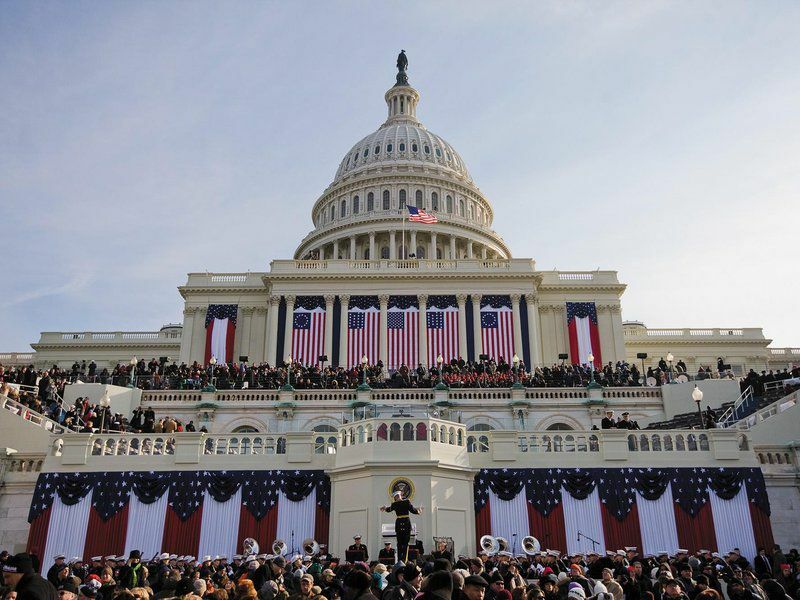 Have students brainstorm a list of traditions associated with the U.S. president or the presidential inauguration. Encourage them to think about items, actions or even routines the president follows. Instruct students to select one tradition from the list. Tell them to conduct research to find out how and when the tradition originated. Encourage them to search for a picture that depicts this early connection. Have students examine how the tradition has evolved over time. Instruct them to identify pivotal moments in history that caused the tradition to change. Encourage them to find pictures depicting each example. Challenge students to identify one way they think the tradition will be implemented or possibly changed when Donald Trump is inaugurated or during or his time in office. Encourage students to draw a picture illustrating their ideas. Have students use the information they collected to create a detailed timeline about the tradition they chose to investigate. Invite students to present their timelines to the class. As they do, make a list of the items or events that led to the various traditions. Have students examine the final list. Tell them to sort the triggering items or events into categories such as popular culture, everyday objects or military actions. Evaluate the results. Challenge students to identify the category that led to the most presidential or inaugural traditions. Brainstorm a list of presidential or inaugural traditions as a class. Then have students complete the project in small groups. Encourage them to include at least three pivotal moments in history related to the tradition on their timelines. Brainstorm a list of presidential or inaugural traditions as a class. Then have students complete the project with a partner. Encourage them to include at least five pivotal moments in history related to the tradition on their timelines. Assign each student a partner. Instruct pairs to brainstorm ideas and select one presidential or inaugural tradition to investigate. Tell them to identify at least five pivotal moments in history related to the tradition. In addition to the basic information required, challenge students to uncover details that tell about the inspiration behind each change. Encourage students to be creative as they incorporate this information into their timelines. Assign each student a partner. Instruct pairs to brainstorm ideas and select one presidential or inaugural tradition to investigate. Tell them to identify as many pivotal moments in history related to the tradition as they can. In addition to the basic information required, challenge students to identify presidents who made changes, however slight they might be, to the tradition. Challenge them to discover why the presidents made the modifications. Encourage students to be creative as they incorporate this information into their timelines. Read this Smithsonian article to take a look back at past presidential inaugurations and learn when some of the traditions we know first took place. Read this Smithsonian article to learn about how our first president created the tradition of giving an inaugural address and swearing the oath of office on a Bible. For a more light-hearted approach to history, read this Smithsonian article to learn about 10 quirky moments from inaugural history, including presidential lassoing. This online exhibition from the American History Museum introduces students to the U.S. presidency through a collection of more than 900 different objects. Composed of 11 thematic sections, the exhibition addresses everything from inaugural celebrations and the presidential roles to life in and after the White House. Use the activities, games and puzzles in this teacher resource guide from the National Portrait Gallery to introduce students to the presidents and the role of the presidency in American history. Did you know that Thomas Jefferson offered his own huge book collection as a replacement when British troops burned the Library of Congress? Or that John F. Kennedy was the youngest ever elected president—and the youngest to die in office? Invite students to learn facts about each U.S. president in this digital collection from the Smithsonian Center for Learning and Digital Access.